Jim Brown (pulpit minister) reading an acknowledgement during the service. Frank was installed as an elder of the church at Franklin on Sunday, April 14, 2019. Frank has been married to his lovely wife, Janet, for 55 years. They have three children: Frank Jr. (wife - Lori), Kelli (husband - Scott), and Johnny (wife Angie). They also have six grandchildren. Frank is a retired coach and high school principal. He has been a member at the Franklin congregation since 1969. Kevin is married to his lovely wife, Suzanne. They have two children - Ashley who will be graduating from Lipscomb University in May 2019 with a degree in nursing, and Aaron - who is freshman at Faulkner University where he is on the JV Baseball team. Jeff is married to his lovely wife, Dawn - who serves as one of our part-time administrative assistants here at church. They have two daughters - Paige (who lives in Cincinnati, OH with husband, John) and Rachel (who lives in Bowling Green, KY with husband, Wes). Jim is married to his lovely wife, Cindy. They have three children: Megan (husband, Andy), Bethany (deceased), and Daniel (wife Rebecca). They also have six grandchildren. 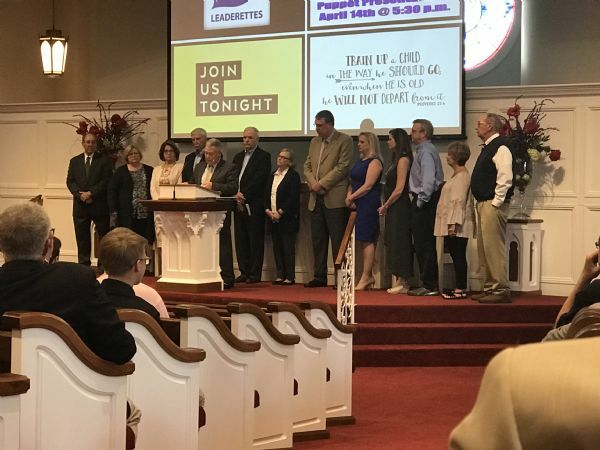 Scott was installed as an elder of the church at Franklin on Sunday, April 14, 2019. Scott is married to his lovely wife, Glenna. Mike was installed as an elder of the church at Franklin on Sunday, April 14, 2019. Mike is married to his lovely wife, Brenda, for 55 years. They have three children: Ben (wife - Kari), Leslie (husband - Barkley), and Justin (wife - Lesslye). They also have six grandchildren.